So, as you know by now, the kinds of DIY’s i veer towards are ones of the easy peasy variety – more than 45 minutes and i’ve generally lost interest. I made this little DIY for a Good Housekeeping Magazine shoot i did towards the end of last year – and it’s the easiest thing in the world. 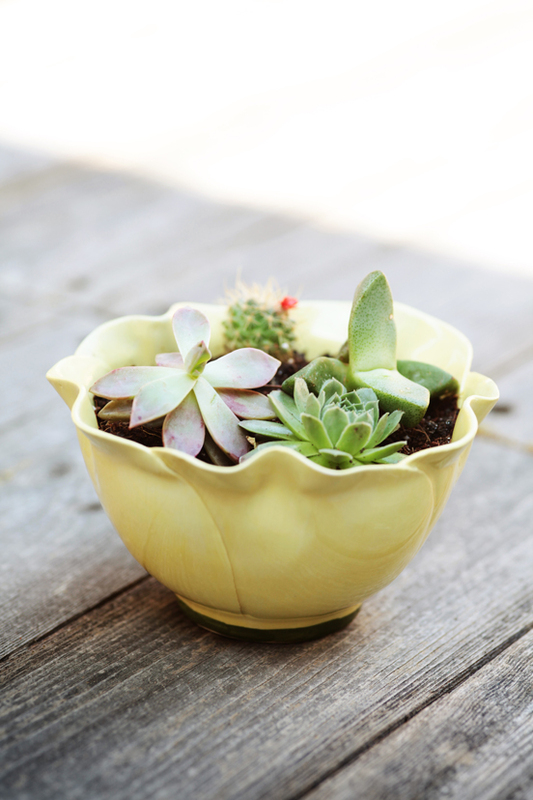 If like me, you have way too many decorative bowls that you love but that you simply don’t use enough, then this is a great way to do so (plus it’s a great gift for somebody). The bowl is a Mustardseed and Moonshine beauty that i was given for a birthday 10 years ago and which i absolutely love. I’ve been feeling guilty about not using it enough and now it has pride of place on my kitchen counter – and it means i think of the friend who gave it to me often! • A suitable receptacle – whether it’s a bowl or an old trophy or perhaps a soup tureen that’s lost its lid. Succulents like shallowish containers so don’t get anything too deep. What a novel idea! My next DIY project.